Specifically-tinted spectacle lenses which may alleviate visual stress often present in conditions such as dyslexia & migraine. 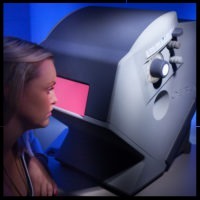 We have a clinic in Solihull offering the Coloured Overlay assessment, and Intuitive Colorimeter - an instrument designed to identify the optimum coloured lenses required by some individuals who suffer from photosensitive problems, known scientifically as Visual Stress. This condition is the cause of some cases of migraine and is very often the underlying reason why some individuals struggle to read. Such individuals are often wrongly labelled as ‘dyslexic’. Dyslexia is an umbrella term for many sensory problems which affect learning. Visual Stress is NOT dyslexia but its symptoms are often confused with dyslexia as they result in poor reading. Sometimes the problem of Visual Stress may run concurrently with other specific learning difficulties, but when visual stress is identified and treated then any remaining difficulties associated with learning are easier to deal with. The first step will be to carry out a full eye examination on any individual who suffers headaches or difficulties with reading. If it is felt appropriate to check for Visual Stress then a coloured overlay screening assessment is recommended which consists of testing with optimum coloured overlays which, placed over a page of text, can often lead to improved reading rate and accuracy. The extent of the problem varies in each individual and whilst some may show vast improvements (sometimes as much as 12 to 80 words per minute) others may merely find reading more comfortable when using the appropriate overlay; but this, in itself, may lead to more interest in reading. Following the application of an overlay the individual will be urged to use it both in the classroom and at home during the ensuing weeks. If improvements are noted and sustained then a further test using the Intuitive Colorimeter will be carried out, when the optimal colour may be identified and Precision Tinted Lenses prescribed. Coloured lenses are much more accurate for the individual and often more useful for copying from the board or from another book. 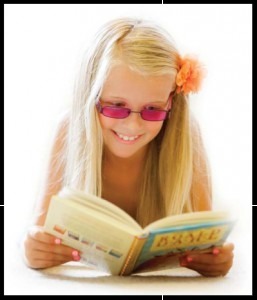 Thousands of children each year are helped to improved reading using overlays and/or coloured lenses. It is our wish to help as many children as possible locally to overcome their reading difficulties and to move on educationally.